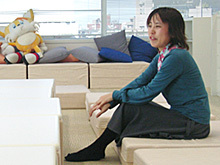 Makiko Nishimura (西村 牧子) is a programmer for Sonic Team and the lead programmer and player character programmer for Sonic and the Secret Rings. Nishimura was part of a theatre troupe in high school and college and held two part-time jobs working at her university and playing the organ at weddings when she was hired by Sega to do sound engineering and Electone work for Roommania #203. From there, she transferred to Sonic Team and became an enemy programmer for Sonic Adventure 2. Nishimura did enemy and stage programming for Sonic Heroes, worked at the sound stage program at Sega Studios USA (also called Sonic Team USA) and became the lead programmer and player character programmer for Sonic and the Secret Rings.